The Mad Rock Shark 2.0 is an advanced rock shoe that excels at technical bouldering and gym climbing. Mad Rock have resurrected their original Shark climbing shoe to make the Mad Rock Shark 2.0, which is just as affordable but packs a bit more punch. The shoe is super-sensitive, with an all-rubber upper and an aggressive down-turn, and the upper is constructed mainly from Mad Rock's R2 rubber, which wraps around the arch and hugs the foot, giving you natural toe and heel hooking prowess. I used these shoes for some sport climbing on limestone around Presles, France. Here are the pros and cons I found. Pros: Great sensitivity as the rubber is thin. Easy to secure as there is only one velcro strap once the shoe is on. I thought they did a good job staying on small edges, pockets and smears. The rubber is nice and sticky too. Cons: I'll list them in the order of importance as I see it. They are super hard to get on and off as the heel cup is both tall and aggressive. When I pulled on the tabs to put them or take them off they were not able to do the job effectively. Another big drawback is that the sizing is very different than the La Sportiva shoes I normally wear. The Mad Rock size 42 fit tighter than my wife's Sportiva 39. I know every company is a little different, so the take home message is that you have to consider the size carefully before buying. 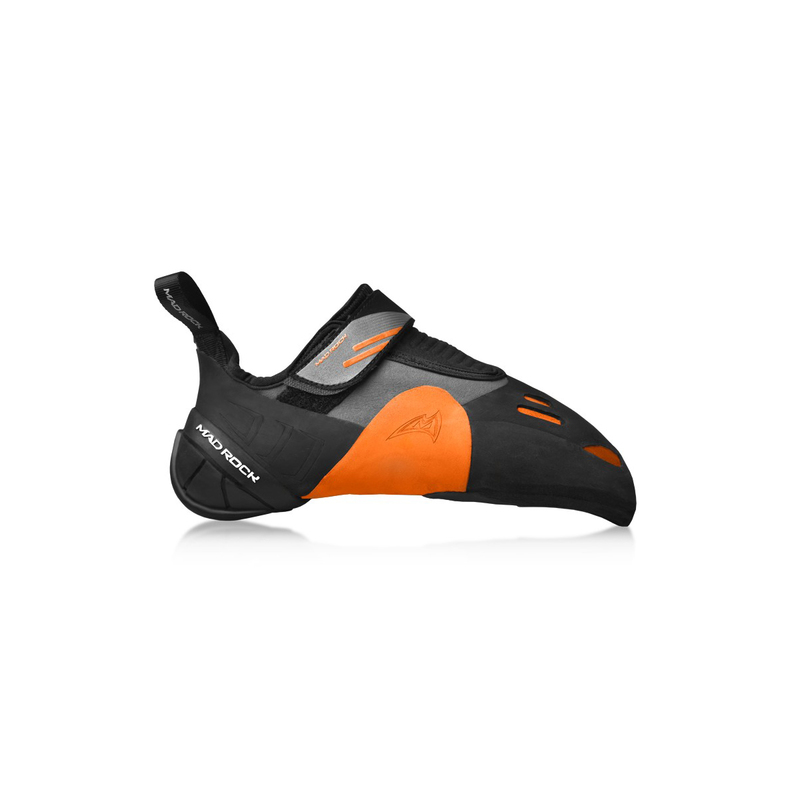 I would recommend these shoes for steep sport climbing and bouldering. However, you are not going to be stoked to do any sort of foot jamming with them. R2 rubber was developed exclusively by Mad Rock for their Arch Flex Technology. It’s sticky and head-wearing, as you’d expect from high performance rubber, but it also has a high elasticity. This means that the shoe will hug and lock on to your foot, providing an exceptional fit without the pain associated with many performance rock shoes. While it means that you compromise a little on breathability, an all-rubber upper provides the best grip over the entire foot. This means that the shoe has enhanced grip, whatever angle your foot is at with the rock. "The Shark 2.0 is an unapologetic specialist’s shoe—soft, grippy, and best for super-steep gym and short, bouldery redpoints. It’s also really affordable." I was put onto these shoes by a sponsored climber which can always be hit and miss, luckily he's a friend so I took him for his word and I'm glad I did. These shoes are really comfortable once you get them on your feet ( I had to exchange them for 1/2 a size up from my original order due to having a high instep). I can happily boulder for a hour with these on before my feet start asking for freedom. These are my go to shoe for roof problems due to the amount of rubber on them. once you get this heel hooked my only fear is that my hands will fail, as that heel is not going to let go.